Many times, I get great recommendations for places to eat or go to in the neighborhood. Evan, one of our patients constantly recommends restaurants. One of Evan’s recommendations was Taco Burrito Express at 1547 N Ashland. 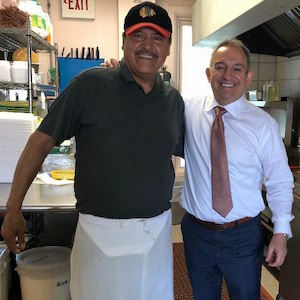 Now, I know that everyone loves La Pasadita, the go-to burrito place in the Wicker Park neighborhood, but give Taco Burrito Express a try. When you walk in Taco Burrito Express you will find a middle-aged woman at the cash register and a middle-aged man making the food. These are the owners of the restaurant. This husband and wife team opened the restaurant in 2006. He was a short order cook for many years when he decided to open his own restaurant. Every time you walk in there, you will find him making food. Usually, his wife works the register but sometimes one of their kids works the register. This is how she gets a break. They work every single day. Monday through Sunday. No breaks and no vacations. When you walk in there, the restaurant is very clean and the owner always has a great attitude. The ingredients are very fresh and tasty. And they really pack in the meat. No skimping. Their food is excellent and affordable. Their menu includes tacos, burritos, salads, tortas, and many other Mexican dishes. Our entire office loves ordering from Taco Burrito Express because of their delicious food. I love their food but I really love their hard working owners. If you like Mexican food give Taco Burrito Express a try. They are located at 1547 N Ashland. I promise you they’ll take great care of you.